After many years of having this place on our bucket list, we’re finally off on our exploration of Iceland. The direct flight from Denver to Reykjavik was a real treat. In just a little over six hours of flight time, we were there. We didn’t know this until we got on the plane, but apparently Icelandic Air was cancelling flights due to a pilot’s strike. Fortunately, the strike didn’t effect our flight, except for the fact that the plane was packed with other passengers whose flights had been cancelled the day before. We picked up our rental car and headed off into the country; it felt like we’d flown to the moon. As far as the eye could see was mostly uninhabited lava fields covered with a greenish/yellow moss. Within an hour of driving, we came to our first destination: The Blue Lagoon. 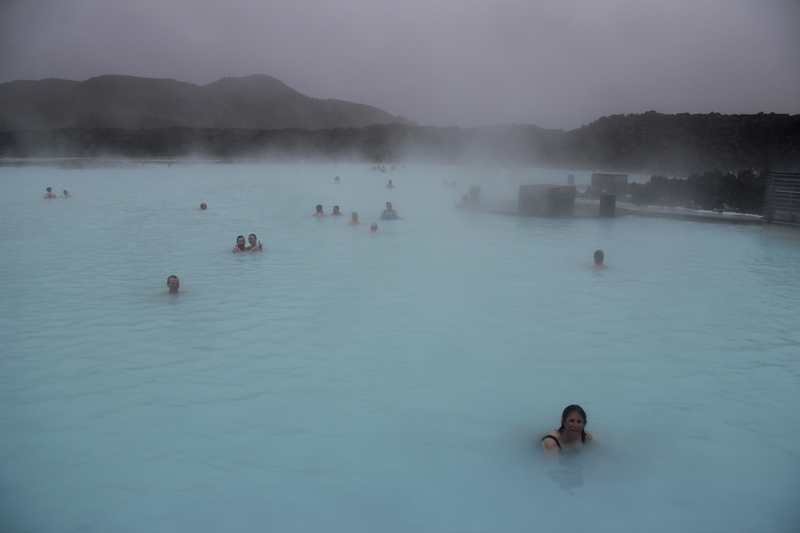 The lagoon is a large lake filled with hot geothermal waters mixed with a silica material that gives it an eerie bluish glow. We figured this was a good first stop to stretch out our muscles after the long flight. We were a little too efficient getting out of the airport as we arrived at the lagoon about two hours before opening. 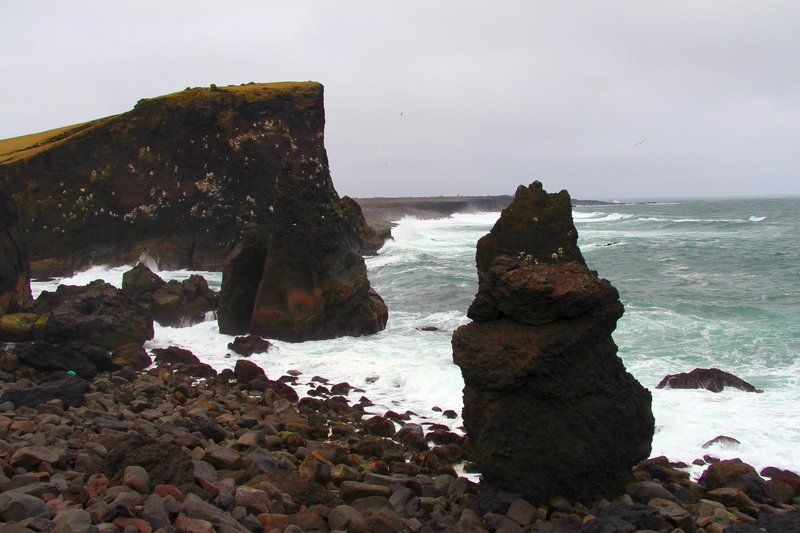 So, we killed some time driving out to the very southwest tip of the Reykanes Peninsula to marvel at the stormy sea battering the spectacular cliffs. 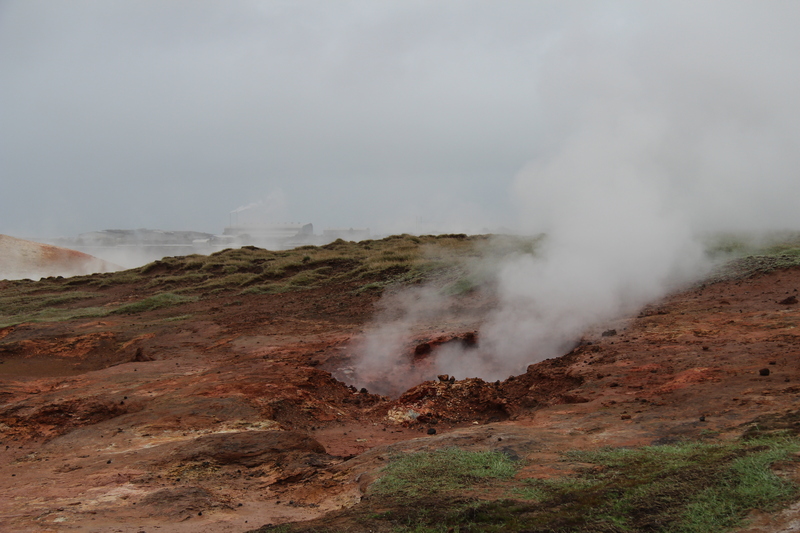 Along the way, we stopped at the first of many geothermal areas we would encounter in Iceland. The ground steamed everywhere, with boiling water and mud bubbling out of cracks in the ground. After our tour of the coast, we finally got to hop into the Blue Lagoon. It was a cold and rainy day, but we didn’t care sitting in the soothing warm waters. This was also the first place that we were introduced to Iceland’s very high prices. The Blue Lagoon, being somewhat of a tourist trap, is no exception to this as the soak set us back about US$90 (not including lunch). Still, the good long soak was worth the expense. After soaking at the Blue Lagoon, we continued through the lava fields along the southwest coast of Iceland, passing through quaint fishing villages that did not appear to have much activity. We then headed north to the town of Laugarvatn where we would spend our first three nights. We celebrated with a great (but pricey) dinner at a wonderful restaurant overlooking the nearby lake. This was where I got my first taste of reindeer meat. The burger was to die for, which is good since it cost more than US$30. A couple of years ago, we did a tour of Lower Antelope Canyon, a spectacular slot canyon near Page, Arizona. Prior to that, we did Upper Antelope Canyon. If you have to choose between visiting Lower or Antelope Canyon, my opinion is that you should jump on the chance to visit Lower Antelope Canyon. It’s less expensive, a longer canyon to explore, is less visited, and you can get awesome photographs at any time of day and year. Photographs in Upper Antelope Canyon are definitely better at specific times of day and year so you would want to plan your trip accordingly. If you’d like to explore Lower Antelope Canyon as a photographer, you can request a photographer’s pass. This will gain you entry to the canyon without a guide, entry a half an hour before other visitors, and allow you to stay in the canyon 2 hours. In order to qualify for a photographer’s pass, each person is required to show the person in the ticket office that they have an SLR camera and a tripod. There are no exceptions to this rule. Photographer’s passes are also $8 more than regular visitor passes. If you plan to visit Lower Antelope Canyon, bring warm clothes no matter what time of year you visit. It can be very cold in the canyon amongst the sandstone canyon walls. Comfortable footwear is recommended and they only accept cash or traveler’s checks, no credit cards. Additionally, things will work better for everyone if you have exact change (check their website for cost). Enjoy your trip and be prepared to be amazed! You will want to stay in the canyon for hours snapping photographs. Around every corner is a new and spectacular view. Don’t forget to look up and behind you – the view is ever-changing. We hope our video will give you a small glimpse of the splendors of Lower Antelope Canyon. I guess it’s better late than never. We have completed a short video of our time to Cappadocia, Turkey where we spent three days exploring the area on foot. We hiked from town to town while our guides transferred our luggage via car. This was a great way to explore the area. We were able to see places that many tourists don’t. We entered the ancient troglodyte houses and churches, at fresh fruit-growing wild in the valleys, and met wonderful locals. You can read about our time in Cappadocia here, here and here. In the spring of 2012, we visited the Big Island of Hawaii and spent several days at the Hawaii Volcanoes National Park. This is a short video of our visit, showing the park in the day and at night. You can read about our visit to Volcanoes National Park here. Understanding how local handicrafts are made adds to the experience of shopping for travel souvenirs. In these videos, we show you how Turkey’s beautiful Chini is made and how hand-knotted rugs are made, starting with silk work cocoons. We’re finally getting caught up on producing videos from our Fall, 2012 trip to Turkey. This short video is of our four-day cruise on a Turkish gulet along the Lycian Coast, between Fethiye and Marmaris. You can read our blog post about our cruise on the Lycian Coast here. I’ve made several trips to the arctic during the summer months. I’m familiar with the long days in the land of the midnight sun, but I’ve often wondered what it would be like to visit this part of the world during the winter when the sun barely breaks the horizon and most of the hours of the day are spent in darkness. One of my big “bucket list” items is to see the Aurora Borealis (Northern Lights) in all their glory, which requires a visit to these northern climes during the dark autumn/winter months. 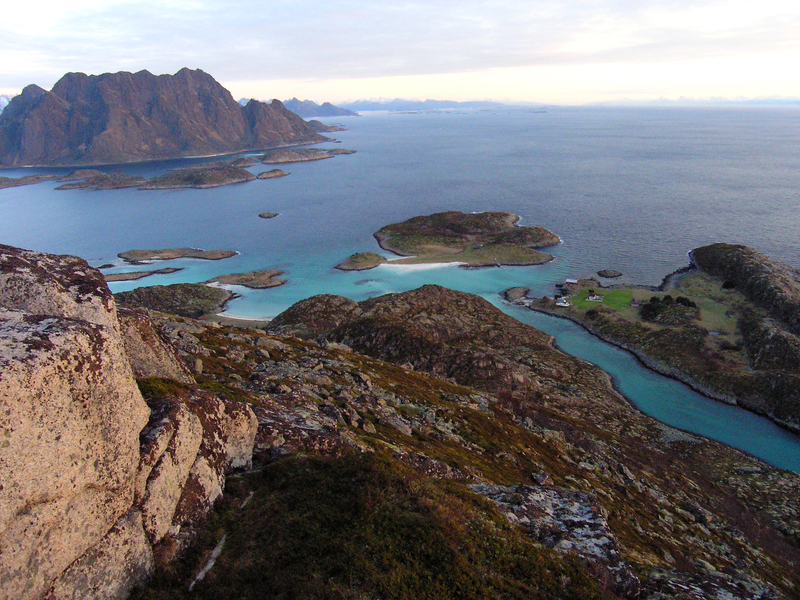 Recently, my wife showed me a website for a sailing trip to the spectacular Lofoten Islands of northern Norway. The trip is on a refurbished vintage sailing schooner and travels around the islands in the months of October and November. I was immediately intrigued and saw this as our first opportunity to experience the Arctic during the colder, darker time of the year. Seemed like kind of crazy idea at first, but the more I thought about it, the more excited I was about this trip. So, we booked a cabin for an eight-day cruise starting November 20, 2014. The Lofoten is an archipelago in northern Norway. The islands, around 80 in total, are located above the Arctic Circle. The journey among the islands will be on the sailing vessel Noorderlicht, a beautiful 46 meters long, two-masted schooner that was built in 1910. 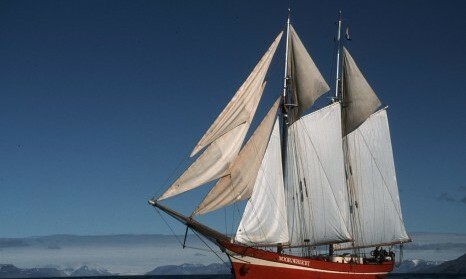 The ship only holds 20 people and passengers are invited to help with hoisting the sails and even working the steering wheel. During the short daylight period, there will be opportunities for guided shore excursions, walks, wildlife spotting and zodiac cruises. 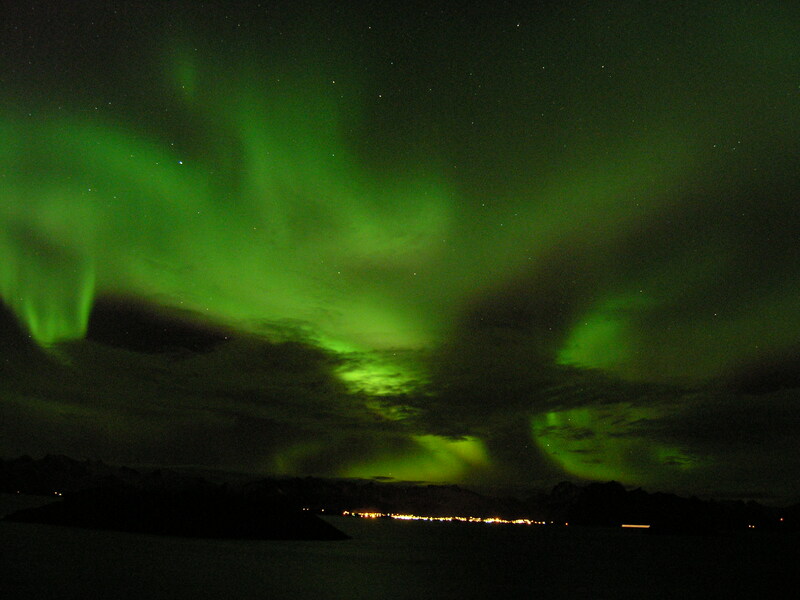 During the long night, we’ll have a chance to see the Northern Lights. The Lofoten Islands are situated at the exactly the right latitude to see the Aurora Borealis, so our chances of seeing this magnificent wonder of nature are pretty good. So….would you like to join us? The ship still has cabins available for the November 20, 2014 sailing date. There is also another sailing on October 30 that still has space available. The cost is US$2,100/person double-occupancy. Single travelers can request to share a cabin with another single or pay 1.7x the double-occupancy rate to have a private cabin. I can make all the arrangements for you with the shipping company. We’ll provide detailed instructions on how to get there, as well as the kind of clothing/gear you should plan to bring along for the activities. Join us for this amazing journey in the Norwegian Arctic. To make a booking, or to get additional information, email me at offtrailtravel@comcast.net. To find out more about my adventure travel agency, go to www.offtrailtravel.com. Don’t wait….space on the trip is filling up fast!